This Home Design Floor Plans page deals with each type of room at a high level. A home design checklist which goes through each room of a floor plan is waiting for you over on the Facebook page. For a really in depth look at design for each room, check out the room by room section. 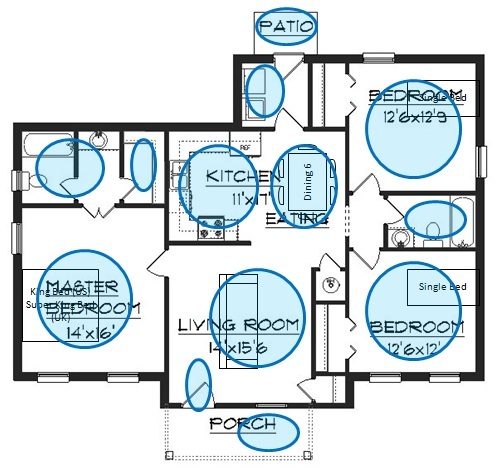 Be sure to take a look at how floor plans for a house work with the outdoor surroundings and how to look at home floor plan designs from a general layout perspective. So, on to the room by room walk-through. Take a look at the floor plan below. 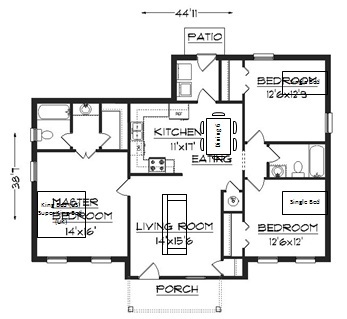 The grey boxes on the page are my review of this floor plan. This floor plan is small and simple but you'll see the principles of the exercise at work. Find the entrances on the floor plan. Sometimes it’s not all that obvious because there isn’t a label or it might be labelled ‘foyer’ or ‘vestibule’. Just have a look for doors in the outside walls and coming in from the garage. Imagine coming into the home from each entrance and check for closet space or the flow into the mud room. Is it important to you that one of the entrances is located next to the laundry? Walking up on to the porch before getting to the front door would be very welcoming. The entrance opens straight onto the living room and there's only a very small closet over on the right so the entry doesn't really have a feeling of it's own space. There might be potential for adding some furniture to act as a closet on the left hand wall of the living area. The back entrance conflicts with the laundry. 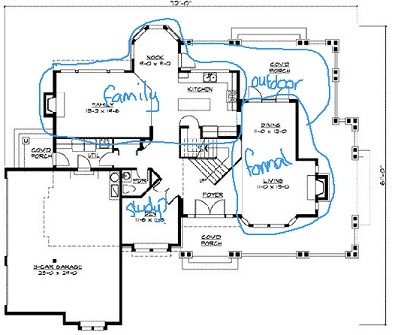 It's important for home design floor plans to have the kitchen layout marked on the plan. Do you like the way the kitchen and the appliances are organized? If you’re in love with kitchen islands is it there on the plan? The dimensions and arrangement of the cooking area are very comfortable. It might be nice to have a window in the wall at the back of the kitchen. Check that the dining areas on the home design floor plan are sensibly placed in relation to the kitchen. Think about the view of the kitchen from the dining areas. Make sure the table has a dedicated space, that doesn't conflict with circulation, and with enough clearance to come and go from the table. The dining area is in the kitchen and I've put a table for 6 in there. There's a conflict with the circulation through to the laundry which might be helped slightly by using a smaller table. The kitchen is fully on display from the table. Personally I prefer not to have to look at all the pots and pans while I'm enjoying a meal. First of all find the main living spaces on the home design floor plan and check that they connect with other spaces (eg kitchen and dining) in a way that works for you. Have a think about how formal and informal spaces might be used if there are several living areas. Does the furniture fit sensibly in the rooms? Think about the views from one space to the other and whether or not you want the areas separated by walls and/or doors. Think about the connection to outside in terms of views, sunlight and moving through to an outdoor space. Check that guests will be able to make their way from the entrance into the entertaining areas in a pleasant way. The living area is in the middle of the floor plan and I've put a big sofa in there that would seat 3 comfortably. There's a conflict with the entry and with circulation moving into the bedrooms and kitchen which all come off the main living room. This room wouldn't receive much light or have a good view since the window is small. Make sure the bedrooms are situated in a more private part of the home design floor plan. In the master suite, check that the bedroom, closet and master bath are in a sequence that works and that the location within the home means it will be a relaxing space to retreat to. Make sure other bedrooms in the house are grouped together and have access to a bathroom. Have a think where the bed and bedside lockers will fit. The bedrooms are grouped either side of the living area which has the affect of denying light from the living area. The layout of the master suite works well and the grouping of the secondary bedrooms around the bathroom is an efficient use of space. Have a look where the bathrooms are. They should be in a private area of the home design floor plan, close to the bedrooms. In smaller homes one of the bathrooms may be used as the guest bath or powder room, in which case there is a fine line to tread between privacy and accessibility. Check that the bathrooms have a good layout and have adequate storage. Sometimes, in larger homes, each bedroom has a bathroom. If this is the case make sure that space in the bedrooms or the bathrooms hasn't been compromised just for the sake of having all bedrooms en-suite. It makes sense in the master suite but for the other bedrooms sometimes a larger bathroom, or a separate bathroom and wc work better in the space. The master bathroom has a nice layout with a wide vanity which would provide some storage. Both bedrooms have a shower/bath. There would be the option of replacing the baths with showers, or in the master bed perhaps giving up the walk-in closet and installing a lovely shower. There's still plenty of room in the master bedroom for wardrobes. Have a think about whether the office is a family space or more of an adult space. See if it is in a sensible spot and imagine what the light will be like and what the noise levels in the surrounding spaces on the home design floor plan will be. Where will you put the desk? There's no space labelled as an office or study space. On this plan the options are placing a desk in the living area, or using one of the bedrooms. One of the wardrobes in the secondary bedrooms could be used as an office space where the doors could be closed. There is plenty of room in those rooms for a wardrobe to be added. Have a look where the laundry is on the home design floor plan – sometimes it’s next to the kitchen or the second entrance – sometimes it’s upstairs – sometimes it’s in the basement. You don’t want visitors walking in on your laundry so make sure it’s in a private area of the home. Where will the washer and dryer go? The second thing you don’t want is people falling over the person dealing with the laundry so make sure there’s space in front of the machines to work without disrupting circulation. Lastly think about the noise. Taking all that into account is the laundry in a sensible spot for you? The laundry is just off the kitchen and is rather small. Anyone coming through the space would trip over anyone doing the laundry or any baskets on the floor. It's sufficiently away from the rest of the home in terms on noise and privacy, providing that the back entrance isn't used for guests. Last but not least - outdoor living is also worth looking at on home design floor plans. Check that the porch or deck is in a good position for sun or shade. Think about the best place for the BBQ and a table and chairs. If there is a garden check that there is good access to and from the garden and a window that looks out onto it. A patio is labelled at the back of the house which is too small for a table and chairs or even just a deckchair on so let's assume it could be made bigger. Even if it is bigger, it isn't well connected with the rest of the house because you have to pass through the laundry to get there. There is a porch at the front of the house which would be big enough to hold a rocking chair to watch the world go by. Most of the windows are on the front of the house. Let's say this home is in Boston so in a place where a home should welcome the sun in. It might make more sense to develop the front of the house as an outdoor area. Figure out where you will park your cars. Many houses have a garage but think about how often you are likely to actually use it. Check that the dimensions of the garage or parking space allow for the doors of the car to be opened easily. When you go out for groceries think about what route from the car to the kitchen will you take. This plan does not show a garage. The best place for it depends on the roads surrounding the lot and the amount of land on the lot around the home. The garage could be placed (either joined or stand alone) at the back of the master bathroom to provide access to the back entrance or next to the bedroom on the right. I hope you've found this home design floor plans room by room walk-through useful. Why not try something similar on your own floor plan. You can get a free floor plan checklist to help you with this if you go over to the Facebook page, like it then click on the free floor plan checklist tab just under the header.